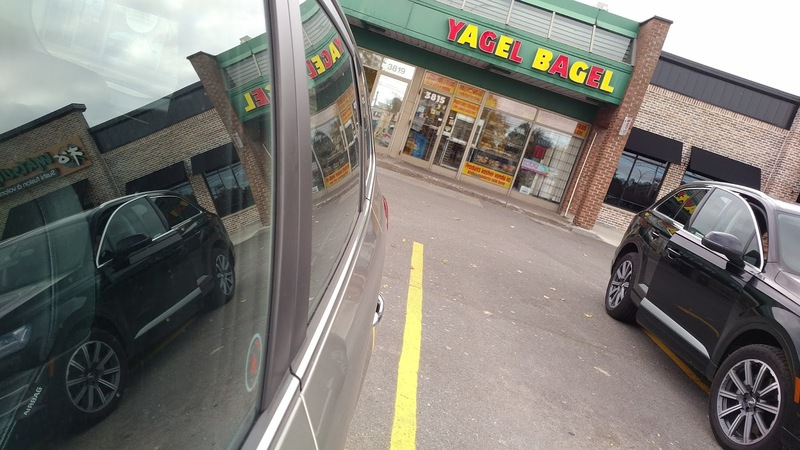 This is Yagel Bagel. It's the bakery at the edge of the neighbourhood where we used to live. Our son was two years-old when we sold the house and pointed the car west, so it hasn't been a part of our reality in a very long time. But memory is a funny thing in its ability to pull you back no matter how many years have slipped into history. I remember walking the munchkin here in his stroller for bagels on Sunday morning. Heck, it's where I picked up a danish - a chocolate babka - on little man's first drive home from the hospital. Our house was just a few blocks thataway, and I have no words to describe what it felt like to open the door on a cold winter's morning. Indeed, on this morning as my wife and I prepared for the long drive back to London, returning here for some last-minute fixins that Ontarians will never fully appreciate seemed like the right thing to do. And it still felt like home. "You cannot get into space by building a faster airplane." I ride my bike to work for a whole lot of reasons, primarily because I believe it's healthier for me and, for the most part, more fun than taking the car. It also helps me bypass the guilt I tend to feel when I decide to drive. Sure, if it's raining, snowing or the all-dominant daily schedule otherwise obviates my taking the bike, I feel perfectly justified in grabbing the keys. But if weather and schedule are both clear, I feel like I'm ripping the planet off if I don't pedal in. So on a brilliantly sunny morning not all that long ago (okay, it was September, and I'm ridiculously behind in getting my drafts posted online), I found myself cruising down the first hill barely two blocks from my house as I settled into an easy spin into the office. As I've done countless times this season, I coasted the bike through the traffic light-controlled four-lane intersection at the bottom of the hill, popped onto the bike path that parallels the sidewalk and spun my legs up to speed. A few hundred metres further on, something didn't feel right. The rear end of the bike felt a little soft, and I could feel a clicking sound coming from the back wheel. Uh oh. I pulled over and looked down to this sight: A large screw stuck right into the tire. Thankfully the tire itself was still holding some air. Figuring I had a few minutes of grace left before the thing completely deflated, I turned the pink wondermachine around and headed for home. A flat tire isn't a big deal in the pantheon of life. Unless you're descending a mountain at 70+ km/h and suffer a blowout, you'll likely live to tell the tale. At low speed and close to home, this one turned out to be a relatively low-consequence event, and one that was easily resolved. So I tossed the bike into the back of my car and headed for the office. Later in the day, I popped into the bike shop near work and had a delightful conversation with another customer who recognized my bike by the year I bought it. While the mechanic fixed my boo-boo, the three of us discussed the challenges of commuting, and the why we still do it despite the risks. Before long, we said our goodbyes as they both helped me wheel my bike back through the creaky wooden door at the front of the shop. As I tucked the bike back into the garage that evening, I realized how lucky I am - that a chance encounter with a sharp object gave me the opportunity to appreciate just how passionate London's cycling community is, and how lucky I am to be a part of it. Something to keep in mind tomorrow morning as I load up the bike again and set off on my morning ride. 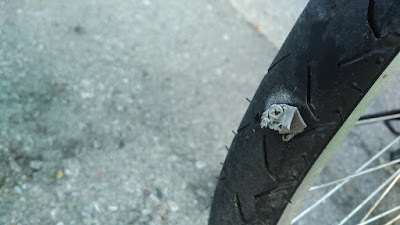 Maybe I was meant to ride over that screw after all. "I think all of us are looking at the future with yesterday's eyes." Autumn might be all about big, bright colors and tones, but that's only one small part of its story. Because once the spectacular leaves turn withering shades of yellow, brown and even grey and then fall unceremoniously to the ground, there's still more than enough there to compel a second look. Or even a third. Because not all beauty is spectacular. It's always there: We just need to work a little harder to appreciate it. 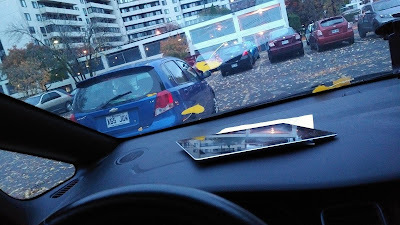 The glamor of early-morning live radio, where you sit in a car in a leaf-strewn, deserted and miserably damp parking lot and hope the winds whipping off the river don't overwhelm your still-sleepy-sounding voice when you go to air. And you get to stare at a similarly wind-whipped Chevy Aveo malaise-mobile because nothing says vehicular sadness more profoundly than a Chevy Aveo. 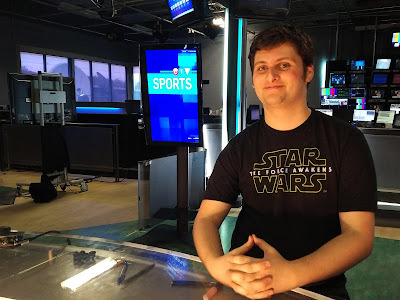 I must have missed this particular class in j-school, yet I wouldn't trade it for anything. There's something soul-refreshing about speaking live with really smart people, painting a picture with little more than the thoughts in your head. Theater of the mind? It's even better than I ever imagined it would be when I was that kid sitting on the receiving end of this magical process, listening to long-vanished broadcast heroes spin similarly magical stories for me. I like to think that there are still kids out there, also listening, also dreaming. And that's why even the most barren, wind-whipped parking lot on a damp, monochrome Sunday morning is as exciting a place and a time as I can possibly imagine. Because it's up to us to seek out these moments, wherever and whenever we can find them. 2.2 decades. 1 charmed life. In my mind's eye, he was just born - and in some ways, I'll always feel that way. Yet reality has a different way of looking at a child's life. Always rushing forward, always straining to reach adulthood, always moving at light-speed away from the little munchkin we drove home from the hospital, so nervous I had the hazard lights on the whole way. Zach turns 22 today, and as much as he'll always be our son, our child, he isn't a child anymore. A subtle difference, perhaps, but an important one. And I couldn't be more proud of the adult he's becoming, the person that he is, and the roadmap that he's simultaneously building and travelling. 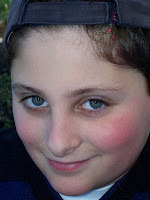 Ten years ago, I took this picture of him and wondered about the next year, the last non-teen year of his life. I called him smart, sensitive and caring then, and those words easily apply today, and then some. Everyone who knows him loves him. He's got a wonderful sense of humor, and is genuinely fun to hang around with. He's become a trusted big brother to Dahlia and Noah, always looking out for them. Okay, almost always. And when school and work beckon, he'll excitedly dissect his next project for you, then be the collaborative force on his team who actually pulls the disparate pieces together. I can't predict his future now any better than I could a decade ago. But no one can - not for our kids nor for ourselves. Still, I do know he's doing a wonderful job figuring out his own path, using the gifts, traits and learnings that have already endeared him to so many. Happy birthday, no-longer-little man. We love you very much. Only good things, today and every day. Aside from confirming that my camera needs a good detailing job (don't worry, the business-end glass is pristine...I believe cameras should proudly wear the scars of everyday use) this photo betrays the realities of shooting when you have no time to do so. We were in Montreal this weekend for the kind of trip no one ever wants to take. Social gatherings weren't on the agenda, but simply being together with the people who matter most very much was. And in between being here and there, I remembered I had stuffed my camera into my backpack in the hurried moments back home when we were getting ready to load the car for the overnight drive. The steel-grey sky was fast fading in the late afternoon as a cold drizzle turned the streets slick. I really couldn't spare the time to go for a walkabout, but in the midst of unspeakable sadness, I felt the need to disconnect and do nothing more than look for beauty in a place that didn't seem to want to offer any up. I was outside for no more than 10 minutes, and shot fast in a futile attempt to keep the lens dry - and myself from getting sick again. I fast-composed in my head, then fast-shot and held my breath that anything would come out in these ridiculously lousy conditions. 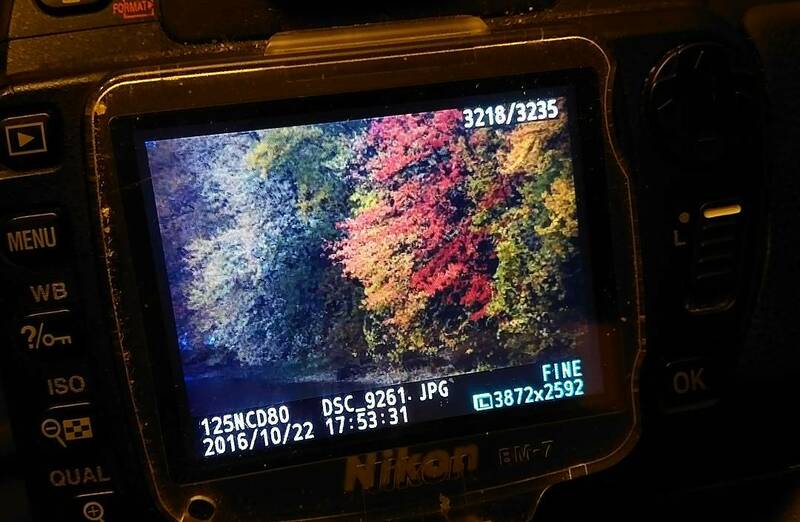 I haven't yet had a chance to offload the results and process them on my laptop, but I thought an initial peek at my screen would provide us all a little inspiration for some autumn-themed shooting this week. Who's in? 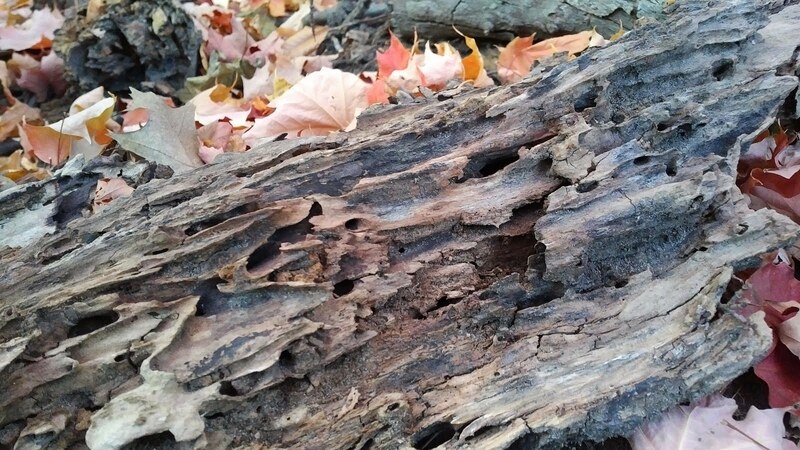 Your turn: Take a picture that reflects this week's theme, Autumn. If it's colorful, or not, or leafy/nature-ish, or not - or whatever, because Thematic is about how YOU interpret a theme - shoot it and share it on your blog, website or social media page. Leave a comment here letting folks know where to find it. Visit other participants and feel free to repeat the process through the week. Bring a friend along, too, if you're so inclined. And if you're new to the Thematic thing, just click here. You'll have fun. Really. The other day, I decided to take a quick detour on the way home from work. Right across the street from us, there's this perfectly pristine conservation area with a bunch of giant ponds in the middle of it, and it occurred to me that despite the fact that I can peer out my office window across four lanes of high-speed traffic and see the entrance, I've never taken the time to walk through its trails. If we're being brutally frank, I wasn't feeling my best. 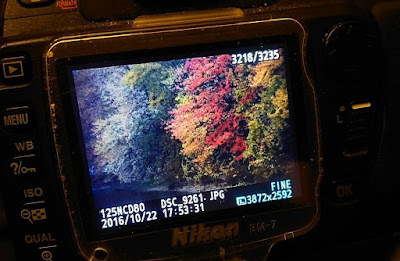 With my backpack slung over my shoulder and my DSLR in my hand, I felt more than a little feverish as I trundled deeper into the woods and allowed my eyes to adjust to the kaleidoscope of colors that now surrounded me. I didn't stay long - just enough to peer across the water, steal a few very lame photos and say hello to a few passing dogs before I turned around and started walking back toward the sounds of traffic in the distance - but I'm glad I carved out those few, fleeting minutes before I had to rejoin the rest of the world. Because as I made my way up the path, I came across this single leaf hanging defiantly from an otherwise bare branch. 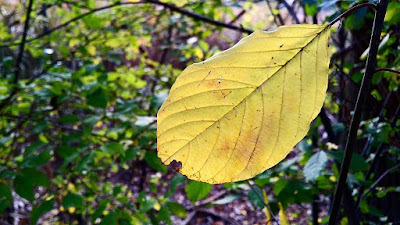 I stopped and stared at it for a minute, not because it was spectacularly colored, but because it wasn't, because it seemed to be one of those plain leaves we'd otherwise miss as we moved ourselves from here to there. I wondered how long it had been before it had turned from green to yellow, and how much longer it might be before it fell quietly to the path below and dried up into a brown husk, never to be looked at again. I wondered if anyone else had ever looked at this particular leaf in this particular way, and decided no, I was probably the only one. It's just a leaf, one among billions in this forest alone that otherwise live their entire lives in shadowy anonymity. And I probably shouldn't have been devoting this much mind-energy to a stupid leaf. Yet as I snapped the quick photo you see here on my smartphone and started back toward the parking lot, I realized why this silly little leaf seemed to stick with me. Because it wasn't about the leaf at all. Rather, it was - and is - about all those other things in life, like moments, people, whatever, that we pass by on our way from here to there, and never bother to think about. What was I missing along the way? I guess we'll never really know, but I do know I'll be walking a little more slowly, on this path and others, from now on. Your turn: What small thing will you try to notice in your own life today? What's worth taking the time? I shot this furtive scene last night as I prepared to leave the parking lot of the TV station. 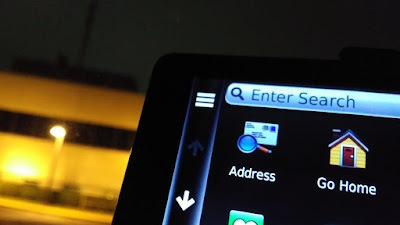 I had just finished my weekly Clicked In segment, and as I powered the GPS on and pointed it home, I thought about how much time I - and by extension we all - spend staring into or at some sort of screen. Compared to my childhood, where the TV was virtually the only screen in the house, we've evolved into a world where everything has one, and hardly a moment goes by that one isn't in view. So for the next week, that's where Thematic is going to go. And I hope your lens goes there, too, because following your lens to new places is why we use our lenses in the first place. 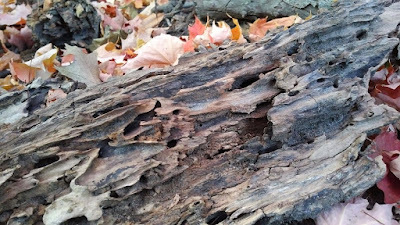 Your turn: Grab a photo that evokes this week's theme - screens - and post it to your blog or website. Leave a comment here letting everyone know where to find it. Visit other participants and feel free to share more snippets through the week. For more info on how Thematic works, click here. If you tweet, feel free to use the #ThematicPhotographic hashtag. And have fun with it, because photography should be fun, and that's what Thematic is all about, too. Thank you all for your kind comments and email messages in recent days. As you can tell, it's been somewhat quiet on the blog here in recent weeks. As much as I love writing here on a regular basis, a rare convergence of lots of work at work, lots of work at home and a nasty cold that flattened me for a good long while forced me to take a break from the keyboard for a bit. I simply needed to get better, and something had to give in the interim. I appreciate your good wishes, and realize how lucky I am to be surrounded by so many people who care. Which is why I thought this photo would be especially appropriate. 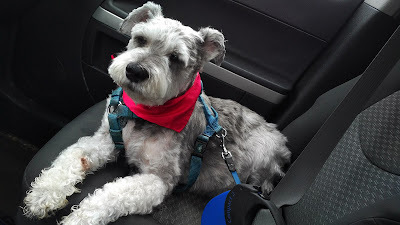 I took it yesterday afternoon, after Frasier had been lovingly groomed by the only groomer he's ever had, Jean. I had just gotten him back in the car, and we were headed home. It's become something of a tradition for me to take a post-grooming pic and send it home. Today was the first day I was feeling well enough to get out and do much of anything. And considering I had delayed his original appointment because I wasn't well enough last week to get out of the house, I felt this picture would serve nicely as a return-to-normal-life milestone. Doesn't he look sweet? Thematic will return at 7 p.m. Eastern - tonight! - what a new theme. Thanks, everyone, for your patience and support.